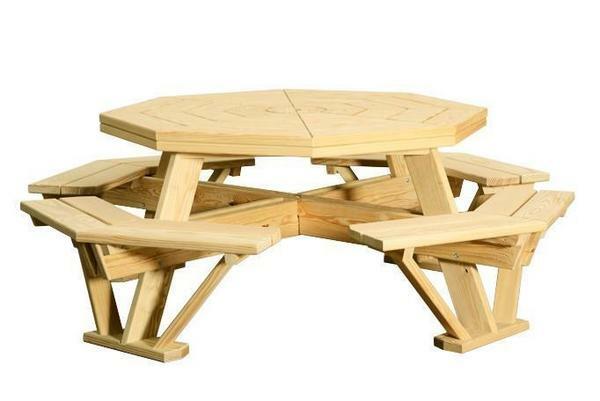 Complete your backyard furniture set with this deftly handcrafted octagon table with attached benches. The perfect piece for a household that enjoys regular meals outside. Add a 7' or 9' umbrella for extra protection and a pop of color. Made of yellow pressure treated pine, this table's materials have been chosen for their outdoor readiness. It's important when you're investing in a central outdoor piece that you know it will last. And that's what we're here for! This table is an example of high quality, solid wood furniture that becomes a part of traditions. If you have any questions about this piece or other outdoor furniture, please do not hesitate to call us at 1-866-272-6773!